For other uses, see Camellia (disambiguation). Camellia is a genus of flowering plants in the family Theaceae. They are found in eastern and southern Asia, from the Himalayas east to Japan and Indonesia. There are 100–300 described species, with some controversy over the exact number. There are also around 3,000 hybrids. The genus was named by Linnaeus after the Jesuit botanist Georg Joseph Kamel, who worked in the Philippines and described a species of camellia (although Linnaeus did not refer to Kamel's account when discussing the genus). Camellias are famous throughout East Asia; they are known as cháhuā (茶花, 'tea flower') in Chinese, tsubaki (椿) in Japanese, dongbaek-kkot (동백꽃) in Korean, and as hoa trà or hoa chè in Vietnamese. 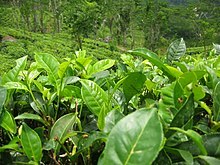 Of economic importance in East Asia, Southeast Asia, and the Indian subcontinent, leaves of C. sinensis are processed to create the popular beverage tea. The ornamental C. japonica, C. sasanqua and their hybrids are the source of hundreds of garden cultivars. C. oleifera produces tea seed oil, used in cooking and cosmetics. Camellias are evergreen shrubs or small trees up to 20 m (66 ft) tall. Their leaves are alternately arranged, simple, thick, serrated, and usually glossy. Their flowers are usually large and conspicuous, one to 12 cm in diameter, with five to nine petals in naturally occurring species of camellias. The colors of the flowers vary from white through pink colors to red; truly yellow flowers are found only in South China and Vietnam. Tea vatieties are always white-flowered. Camellia flowers throughout the genus are characterized by a dense bouquet of conspicuous yellow stamens, often contrasting with the petal colors. The so-called "fruit" of camellia plants is a dry capsule, sometimes subdivided in up to five compartments, each compartment containing up to eight seeds. The various species of camellia plants are generally well-adapted to acid soils rich in humus, and most species do not grow well on chalky soil or other calcium-rich soils. Most species of camellias also require a large amount of water, either from natural rainfall or from irrigation, and the plants will not tolerate droughts. However, some of the more unusual camellias – typically species from karst soils in Vietnam – can grow without too much water. Camellia plants are used as food plants by the larvae of a number of Lepidoptera species; see List of Lepidoptera that feed on Camellia. Leaves of the Japanese camellia (C. japonica) are susceptible to the fungal parasite Mycelia sterile (see below for the significance). Camellia sinensis, the tea plant, is of major commercial importance because tea is made from its leaves. The species C. sinensis is the product of many generations of selective breeding in order to bring out qualities considered desirable for tea. However, many other camellias can be used to produce a similar beverage. For example, in some parts of Japan, tea made from C. sasanqua leaves is popular. The camellia parasite mycelia sterile PF1022 produces a metabolite named PF1022A. This is used to produce emodepside, an anthelmintic drug. Mainly due to habitat destruction, several camellias have become quite rare in their natural range. One of these is the aforementioned C. reticulata, grown commercially in thousands for horticulture and oil production, but rare enough in its natural range to be considered a threatened species. The earliest fossil record of Camellia are the leaves of †C. abensis from the upper Eocene of Japan, †C. abchasica from the lower Oligocene of Bulgaria and †C. multiforma from the lower Oligocene of Washington, United States. With the expansion of the tea trade in the later 18th century, new varieties began to be seen in England, imported through the British East India Company. The Company's John Slater was responsible for the first of the new camellias, double ones, in white and a striped red, imported in 1792. Further camellias imported in the East Indiamen were associated with the patrons whose gardeners grew them: a double red for Sir Robert Preston in 1794 and the pale pink named "Lady Hume's Blush" for Amelia, the lady of Sir Abraham Hume of Wormleybury, Hertfordshire (1806). 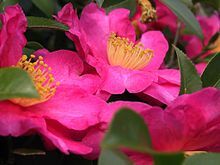 The camellia was imported from England to America in 1797 when Colonel John Stevens brought the flower as part of an effort to grow attractions within Elysian Fields in Hoboken, New Jersey. 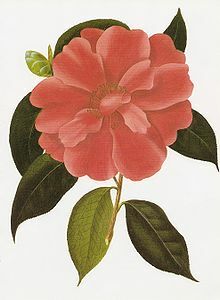 By 1819, twenty-five camellias had bloomed in England; that year the first monograph appeared, Samuel Curtis's, A Monograph on the Genus Camellia, whose five handsome folio colored illustrations have usually been removed from the slender text and framed. Camellias that set seed, though they did not flower for more than a decade, rewarded their growers with a wealth of new varieties. By the 1840s, the camellia was at the height of its fashion as the luxury flower. The Parisian courtesan Marie Duplessis, who died young in 1847, inspired Dumas' La Dame aux camélias and Verdi's La Traviata. Today camellias are grown as ornamental plants for their flowers; about 3,000 cultivars and hybrids have been selected, many with double or semi-double flowers. C. japonica is the most prominent species in cultivation, with over 2,000 named cultivars. Next are C. reticulata with over 400 named cultivars, and C. sasanqua with over 300 named cultivars. Popular hybrids include C. × hiemalis (C. japonica × C. sasanqua) and C. × williamsii (C. japonica × Camellia saluenensis|C. saluenensis). Some varieties can grow to a considerable size, up to 7002100000000000000♠100 m2, though more compact cultivars are available. They are frequently planted in woodland settings, alongside other calcifuges such as rhododendrons, and are particularly associated with areas of high soil acidity, such as Cornwall and Devon in the UK. They are highly valued for their very early flowering, often among the first flowers to appear in the late winter. Late frosts can damage the flower buds, resulting in misshapen flowers. The Camellia family of plants in popular culture. 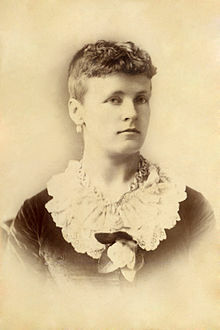 The 1848 novel The Lady of the Camellias is named for the camellia. The Camellia was a symbol of Brazil's abolitionist movement during the Imperial age. It was common practice for abolitionists and supporters of the idea to plant Camellias to show that that household was abolitionist. ^ Kroupa, Sebestian (Nov 2015). "Ex epistulis Philippinensibus: Georg Joseph Kamel SJ (1661–1706) and His Correspondence Network". Centaurus. 57 (4): 246, 255. doi:10.1111/1600-0498.12099. ISSN 1600-0498. ^ Mair and Hoh (2009). ^ The International Camellia Society. Flowers of Camellias. ^ How to Use Japanese Camellia (Tsubaki) Oil. .
^ Journal of Plant Research, September 2016, Volume 129, Issue 5, pp 823–831, Camellia nanningensis sp. nov.: the earliest fossil wood record of the genus Camellia (Theaceae) from East Asia by Lu-Liang Huang, Jian-Hua Jin, Cheng Quan and Alexei A. ^ Kaemfer, Amoenitates exoticae, 1712, noted by Alice M. Coats, Garden Shrubs and Their Histories (1964) 1992, s.v. "Camellia". ^ "RHS Plant Selector Camellia 'Cornish Snow' (cuspidata × saluenensis) AGM / RHS Gardening". Apps.rhs.org.uk. Retrieved 2013-04-29. ^ "RHS Plant Selector Camellia 'Cornish Spring' (cuspidata × japonica) AGM / RHS Gardening". Apps.rhs.org.uk. Retrieved 2013-04-29. ^ "RHS Plant Selector Camellia 'Francie L' AGM / RHS Gardening". Apps.rhs.org.uk. Retrieved 2013-04-29. ^ "RHS Plant Selector Camellia 'Freedom Bell' AGM / RHS Gardening". Apps.rhs.org.uk. Retrieved 2013-04-29. ^ "RHS Plant Selector Camellia 'Inspiration' (reticulata × saluenensis) AGM / RHS Gardening". Apps.rhs.org.uk. Retrieved 2013-04-29. ^ "RHS Plant Selector Camellia 'Leonard Messel' (reticulata × williamsii) AGM / RHS Gardening". Apps.rhs.org.uk. Retrieved 2013-04-29. ^ "RHS Plant Selector Camellia 'Royalty' (japonica × reticulata) AGM / RHS Gardening". Apps.rhs.org.uk. Retrieved 2013-04-29. ^ "RHS Plant Selector Camellia 'Spring Festival' (cuspidata hybrid) AGM / RHS Gardening". Apps.rhs.org.uk. Retrieved 2013-04-29. ^ a b "RHS Plant Selector Camellia 'Tom Knudsen' (japonica × reticulata) AGM / RHS Gardening". Apps.rhs.org.uk. Retrieved 2013-04-29.